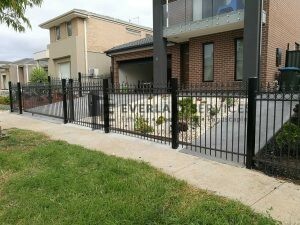 Our galvanised steel fencing delivers on all fronts. It looks good, it’s stable and your initial investment will last for years. We’ve been doing this for over 20 years, and we manufacture our own steel in our Hoppers Crossing factory, so you know you’re getting the best. We work with you through all stages of the project. We can help you design the fence, we manufacture everything you need, and then we help you to install it. Galvanised fencing is not just built for strength, it looks incredible, and if you look around your local area, you’ll start to see it everywhere. It offers both security and durability, making it perfect for domestic industrial and commercial spaces. With our galvanised steel fencing, you decide what comes onto your property, and you keep your property looking great at the same time too! On top of all those benefits, steel fencing is low maintenance. To keep it looking in perfect condition, you just need to hose it down every now and then. We are 100% Australian owned and operated and always will be. We manufacture everything at our plant, and source products from local suppliers. It’s our way of giving back to the community and economy that has given us so much. Our first priority is to deliver a superior product that provides excellent value for money. To do this, we maintain strict quality control over everything that leaves our warehouse, and our tradesmen don’t leave until they’ve installed the perfect fence. We don’t believe that quality should come at a price. We make savings by manufacturing our own products and staying loyal to our suppliers, and we always include these savings in your quote. We offer the full suite of home improvement services. We can also provide assistance in building pergolas and decks, installing driveway gates and fences and much, much more.